It was a salve to my heart. 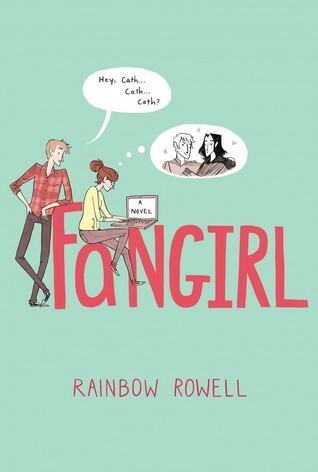 Rainbow Rowell gets fanfiction. She really, really gets it. What amazes me to no end is that when I finished it, I was sad that the world of Simon Snow was not real and that I couldn’t pick up that series and read it myself. Rainbow Rowell creates a believable fictional universe for Cath to obsess over. Sure, it’s inspiration is obvious, but it’s reminiscent enough of Harry Potter to have a hint of tongue and cheek humor about it yet unique enough that it stands on its own. The snippets of Cath’s fanfic and the “original” Simon Snow story were delightful. And, Cath writes slash fanfic! If you’re not into fanfic, I could see how these interludes between chapters would be boring and tedious, but I absolutely loved them. It isn’t just this super cute and compelling fictional world Rowell created—It’s the characters that really make this novel come alive. Cath’s roommate, her friend Levi, Cath’s sister, Cath’s classmates, they all had their own personalities, their own dreams, their own motivations, rather than just existing to further Cath’s story. Unlike the college stories I see coming out in “New Adult” fiction, this felt much closer to capturing the actual college experience, which brings incredible freedom and potential for self-discovery and an opportunity to reinvent yourself, but also fear and insecurity and the loss of everything that you thought made you you. In addition to learning to live without her sister, crushing on a new boy, and finding her own voice as a writer, Cath is also dealing with family issues. Rowell wove all of the parts of Cath’s life together into a seamless story, where each aspect of Cath’s life impacted the other. The different elements of the plot all fit together. I was submerged in this world for the day I read this novel, and once I finished, I wanted to start it back over again. Rainbow Rowell captured my heart with Eleanor & Park. I loved her adult novel, The Attachments. But Fangirl solidified her spot among my favorite authors. What all of her books have in common are completely ordinary characters that are all extraordinary in the eyes of someone who loves them. Her characters all feel achingly real, lovable and flawed and imperfect and familiar. The beauty of her writing is in the details, the wonderful turns of phrase, the quiet moments, moments that somehow feel as mind-blowing and significant as the most thrilling action-sequences. If you couldn’t tell, I’m kind of a Rainbow Rowell fangirl. Despite my love for this book, it was not without its flaws. Although we get snippets of Cath’s fanfiction and the world of Simon Snow, I didn’t feel like we got to see Cath interact with the fandom very much. We learn in passing that Cath’s beta is a grad student in Rhode Island, but we don’t see the back and forth between them and how their interactions shape her story. We know Cath has legions of fans in the online world of the Simon Snow fandom, but we don’t see Cath interact with them other than through blog posts. There’s no Twitter conversations or forum discussion. Cath doesn’t enter or host contests or raise money for causes by auctioning off stories. And these are all things that diehard members of a fanfiction community do. There’s a moment where she meets someone who is aware of her story and the fandom, but nothing ever comes from it. While the story did capture Cath’s love of Simon and Baz and the world they live in, and I totally felt how much she loved writing fanfiction, the idea of fandom wasn’t quite realized. I do think these elements would be difficult to make dynamic and interesting in a novel, but I think the story would have been stronger if this world would have been more fully realized, even if it meant sacrificing one of the other subplots. Rainbow Rowell writes in third person, and in all of her novels, I think this lends to more “telling” and less “showing.” Though there are lots of lines I absolutely adored, there are passages that felt awkward and description inserted around dialogue that didn’t really add to the story (seriously, I know characters need to be doing things, but a whole conversation over dinner doesn’t need to be all about the stabbing and chewing vegetables every other line). I’d hesitate to call this in any way “literary.” While it’s a good story with fun characters, it’s more of a light read than a elegantly written, bittersweet story, which is what I tend to think of as capital-L literature. There are a lot of threads to this story: Cath’s relationship with her sister and her sister’s alcohol abuse; Cath’s relationship with her roommate; her budding romance with Levi; her writing class and a critique partner who may be using her; her unstable father and absent mother. I was surprised and and maybe a little disappointed by how neatly everything was resolved. I think most people’s enjoyment of this novel will come down to how much they connect with Cath. She’s extremely judgmental, and confident to the point of naiveté in certain aspects of her life, but all but frozen from learning and branching out in others (but as ridiculous as her fear over the cafeteria was, I could totally relate). I saw a lot of my college freshman self in Cath, and I imagine others will, too. But she’s not easy to love. As much as I liked the premise of this novel, it didn’t approach my love for Eleanor & Park, but I’ll gladly read anything that Rainbow Rowell writes in the future, whether YA or adult. I’m looking forward to this one! I pre-ordered it after reading Katie’s review at Words for Worms, but I was hoping you would review it too. I really appreciate that you’ve touched on some of the flaws while raving about the book overall. I’m looking for light reads these days. I’ve read Attachments (after seeing your review of it), but I still haven’t read Eleanor & Park. There’s something holding me back, and I’m not sure what it is. I was just talking about this book this weekend, and how it’s nice to see the reviews start popping up. I’m so glad to hear that you enjoyed it, and I think it’s a really interesting point with the telling and not showing. That’s my biggest conundrum when I’m reading. It makes it harder for me to feel what the characters are feeling. RE: telling v. showing — that’s why I prefer most books in first person, I think. Unless it’s epic fantasy. I can’t wait to read this one. And Cath definitely sounds like a college freshman. It’s fantastic that you connected with this so much. Fangirl was actually a DNF for me, and I chalked it up to the fact that I know effectively nothing about fan fiction (and the general culture around fandoms). I imagine that if I did, my results would have been quite different. (I loved Attachments, though.) I do agree that this is much more in the vein of what I expected a “new adult”-type story to be, though. The stickiness of those first years of semi-independence are ripe for stories, and I’d love to see more along these lines. Yeah, if you’re not into the whole fanfic thing, I could totally understand how this just wouldn’t work for you. (And yes, Attachments in awesome!) I would like to see more of these types of college-setting stories, too, whether for YA, NA, or just the plain adult market.